You wouldn't think I'd travel to see this one. I once listed all the problems in Love Never Dies and wrote a short story to contradict the newspaper critic who dared to call it good. If you ask me how I ended up sitting in the front row of Det Ny Teater's auditorium with my friend, waiting for the Phantom sequel to begin... I still don't know, and I've had some months to think about it. But I do know that I haven't regretted the trip for a second. If you've read my thoughts on the West End version, you know I think LND's music is okay but the story is beyond stupid. But when you mix it with talented actors, absolutely gorgeous visuals, plus a language I don't understand so I can't be bothered about the lyrics... It took me by surprise how much I enjoyed the show. I was pulled into its world and felt invested in the characters' journeys instead of internally mocking them. The cast was good. Christian Berg as the always drunk and brooding Comte de Chagny was my favourite, Bo Kristian Jensen as the Phantom made his character quite believable, and Louise Fribo's rendition of the title song (that I usually find boring) was gorgeous. A shoutout to Carl-Emil Lohmann as Gustave, such a beautiful voice! But for me, what made the Copenhagen Love Never Dies so enjoyable were the visuals. The show looked much better than how I remember the West End production. Here's a production that doesn't pale in comparison to the original Phantom! The sets, the costumes, the acrobatics and pyrotechnics, the subtle nods towards the original's designs, all seen in great detail from the front row... I don't remember when I last was so amazed by the sheer beauty of a theatrical production. 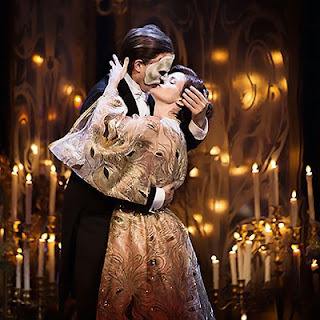 Overall – I still think Phantom fans have every right to be upset about Love Never Dies and its sad excuse of a plot, but I'm glad I saw this. I recommend it for all in need of some eye and ear candy! Having seen the movie and listened to a couple of CDs, I looked forward seeing Lindy Larsson as Che the most. Well, I knew nothing of Larsson himself beforehand, but I love Che's songs and character. My expectations were through the roof. Even then, Larsson blew me away. He sung the part perfectly, I liked him better than anyone I've heard in the role so far. And his sarcasm, his stage presence... Ugh, I'm risking having a complete fangirl meltdown here. Moving on. I wasn't quite so into Charlotte Perrelli in the title role. Her vocals were quite strong and her tone vaguely reminded me of Patti LuPone's and Elena Roger's powerhouse portrayals, but I'm afraid the charisma necessary for the part was missing. Probably thanks to Linus Tunström's direction, it seemed the character was never on the top of her game. Eva was always unsure, always frightened. Even Don't Cry for Me, Argentina seemed less than confident. Evita's downfall didn't have much of an effect when she never seemed to be rainbow high at all. Fred Johanson, then, did a good job in all those two scenes where the character of Perón has some emotion to display. Johanson has a wonderful voice, and seeing him as Javert in 2011 convinced me that he can also act, but this is not a show where he can prove it. Perón simply doesn't have much material to work with. Oh well, I was glad to see Johanson nevertheless. The staging in this production was quite plain and the lights were harsh. The focus was mostly on the acrobat onstage, Christel Elisabeth Stjernebjerg. Dressed identically to Eva, the acrobat shadowed what the title character was going through: climbing the social ladder, flying, falling. I like the idea, and during some scenes, I understood exactly what the director was going for – but during other scenes, I had no idea what the acrobat was supposed to signify. Actually, that applies to the whole show. Some scenes worked perfectly, but during some, it seemed the director didn't understand the source material at all. Eva felt quite lost in her own story, even during the moments where extreme confidence is written in the script. But thanks to Lindy Larsson, I'm happy I saw this. Love Never Dies photo by Miklos Szabo. 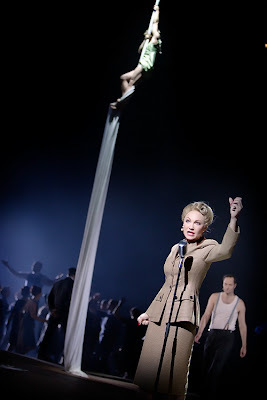 Evita photo by Malin Arnesson. That sounds like a really weird Evita. The HKT production was just very empty, though I liked some of the visual stuff, but sounds indeed like someone in Malmö has either gotten things wrong or wanted to bring a whole new viewpoint to the story with little logic. Che is my favourite character in the musical (narrators <3) so I'm glad to hear he was good! I think you would like Lucheni in Elisabeth if you haven't watched the musical yet. He's a bit like Che v.2.0. but clearly a separate entity and not just a copy of Che (at least in the better productions).